As both the daughter and the widow of spies, Charlotte Moncrieffe is determined to use her training, skills, and unique dirigible to become a spy herself. Though her father objects, Charlotte is determined to serve the Crown by recovering documents her late husband hid at the Palais Garnier during the last war with France. There’s just one problem. Her father – in a bid to keep Charlotte from engaging in espionage – has convinced her superiors that Charlotte must not go to France without a proper cover. And that cover involves marriage to inventor Dexter Hardison, known as the Makesmith Baron. Dexter only knows Charlotte through letters, but he’s fascinated by the unusual widow. When he strikes a bargain that could further his own research, he doesn’t expect to find himself falling hard and fast for his new wife. The passion he feels for Charlotte is tempered by her insistence that their marriage will only last the length of the mission. Dexter’s determined to convince her to give their relationship a chance, but can he get through the walls she’s built around her heart? If a rogue spy and a dangerous megalomaniac have their way, neither Dexter nor Charlotte will live long enough to find out. A world of possibilities await you in Gossamer Wing. Delphine Dryden has created an imaginative universe filled with plausible technological marvels and wonderfully creative steampunkery. I was intrigued by Ms. Dryden’s alternate-history America, one where the U.S. lost the Revolutionary War and is still under British rule. The alternate-history aspect of the story added a level of uniqueness to Gossamer Wing, particularly since the story features spies. World building aside, Gossamer Wing features two protagonists who are innately likeable. Charlotte is an intelligent, headstrong woman, and the death of her first husband on their honeymoon forever changed her. She’s determined to gain closure through her first fieldwork assignment and nothing and no one will stop her. She’s thrown for a loop, however, by Dexter. It’s impossible for her to resist the big bear of a man; physically and intellectually, he attracts her. Dexter’s inventiveness, sensuality, and patience make him a sigh-worthy hero. He’s a great match for Charlotte, but it isn’t easy for her to accept that they could have a real marriage (though I admit I didn’t always understand her logic). Gossamer Wing is the first Steam and Seduction novel, and though it wasn’t quite as engaging as I’d have liked (I never felt emotionally invested in the story or the characters), I definitely can’t wait to read the next book, Scarlet Devices. 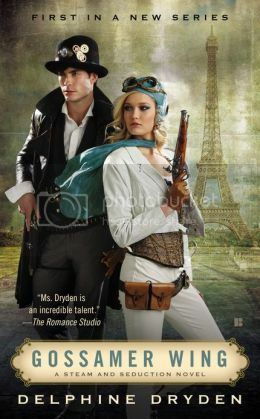 If Gossamer Wing is anything to go by, Ms. Dryden’s world building is sure to be a gift to readers that keeps on giving. I love novels like this so I can't wait to get my hands on it! Thanks for the great review!